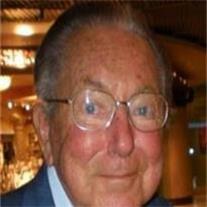 Edmond Adolph Backlund, 89, passed away November 20, 2011 in Gilbert, AZ. He was born May 25, 1922 in Ft. Bragg, CA. He is survived by his wife Donna Backlund, sons Steve (Myra) and Gary (Jerry) Backlund, step-sons Michael (Karen), Matt (deceased), Mark and Mitch (Sue) Cutchen, 7 grandchildren & 17 great grandchildren. Services will be held on Friday, November 25, 2011 at 11 AM at the LDS Fairview Ward Bldg., 2700 E. Galveston St. Gilbert, AZ 85295. Private interment services will be held. Arrangements by Bunker’s Garden Chapel.